It’s that time of year again, spring is on its way. You’re sheepishly filling up your petrol tanks and charging your camera’s ready for those all-important selfie bike shots. You scroll through your Instagram feed, and then it hits you, photo after photo of several bearded men you met at your last bike meet up. So to help you out, (in no particular order) here’s our 2018 list of biker chicks absolutely killing it on Instagram. If Barbie owned a motorbike, she would be called Leralapochka. 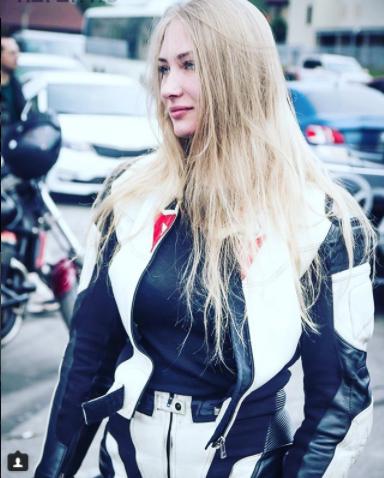 Straight from St. Petersburg in Russia, this gorgeous 23 year old can often be seen zooming around on her Suzuki GSXR600. With 3 years motorcross experience, she’s no newbie on two wheels. She told us her dream bike is a h2r but unforunately isn’t road legal! Mizzmegzz is a real-life power ranger from Ontario, Canada and everything about this girl is pink and fast. Currently riding her pink Suzuki GSXR 600 and pink Kawasaki Ninja 300cc, this girl is not one to be missed. Her dream bike is the KTM RC8 R but states that she hasn’t quite worked out how to rock the pink and orange look. Brittany, 23 from Dallas, is a girl made of steel. After surviving a crash on her zx6r AND being hit by a drunk driver, this girl came back stronger than ever by buying herself a stunt bike! Brittany has been riding for over 4 years and says her dream bike is one she’s built up from the frame herself. Brains and beauty! Anti_parallali is a girl that shouldn’t be reckoned with. Originally from Romania but now based in Pennsylvania, US, this girl can be seen revving it up on the twisties and shooting guns. She’s been riding since 2014 and her dream bike is a Fz09 (MT 09) or a Z900! Cassandra is 26 years old from London. This girl was made to live life in the fast lane..on one wheel… with her hands in the air. 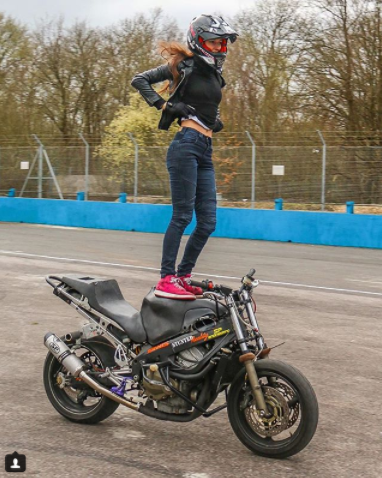 If you like Biker chicks and stunts, her feed is one to watch out for. Frequently seen killing it on her CBR 600, this girl knows no boundaries. Cassandra has been riding for over 5 years, but recently began stunt riding only 3 years ago. She says her dream bike is a KTM “as they’re really good for wheelies”. Not just a pretty face, _RubyRides_ stands true to her name, because wow can this girl ride a bike well. 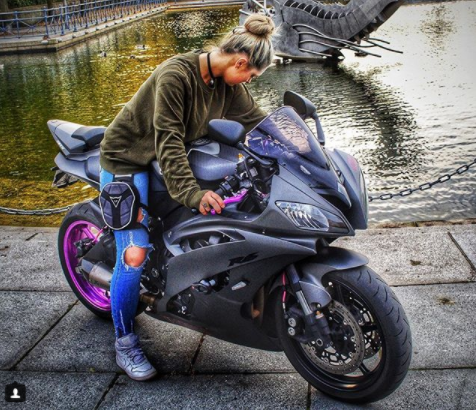 Not only that, but this chick has one of the most impressive bike collections we’ve seen on insta, owning a Ninja H2, S1000RR HP4, CBR1000RR AND her R1 4C8. I know, we’re jealous too! Xenia is a 21-year-old hot biker chick from Berlin, Germany. After graduating from a Yamaha r125 to a R6 rj15, this summer marks the start of her third season in the biker world! Xenia says that her dream bike is a R1 rn32 because it’s the sexiest bike she’s ever seen! With nearly 20,000 fancs online, she’s certainly one to add to your follow list! Straight from the Netherlands, Miss_aussenhaus isn’t your fair weather rider., she’s cute, fashionable and can certainly worth a follow. She’s only 23 years old and has been riding less than a year. She currently rides a Suzuki SV650S but says that her dream bike is a Honda 600rr and a Suzuki GSXR 750. She often posts photos from her daily rides, track days and biker events that she attends! Mariza_Zx, 28, has been riding for just over two years, her feed is full of awesome photos and fun vids riding around Greece. She owns a Kawasaki Zx10r. She describes herself as a biker addict, loves track days and even has her own youtube channel that you can check out! 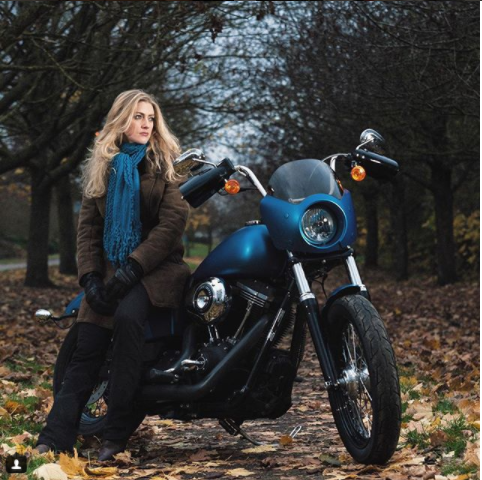 Thegirlonabike, known to her friends as Vanessa, 31 from England, can often be seen riding her Harley-Davidson DYNA Street Bob and KTM EXC 200 2-stroke. She first got into motorcycling when she ordered a bike from China, whilst working in the Bahamas. After trading a box of rum for someone to piece the bike together, she’s never looked back. We can certainly say this woman has one heck of a sense of adventure. If you want to nominate a biker chick for next years top 10 biker chicks, feel free to drop a comment below and we will be sure to check out your account! In the mean time, feel free to follow Ant on a Slant on Youtube for regular updates and motorcycle news! Previous articleMP demands Theresa May to stop motorcycle crime.